LATAM launch new inflight dining experience. 300 new dishes will be introduced over 64 daily flights. New menus to include three options for lunch or dinner and two breakfast choices. New dining experience will be rolled out across entire network. When tested the improved menus saw a 28% improvement in customer satisfaction. 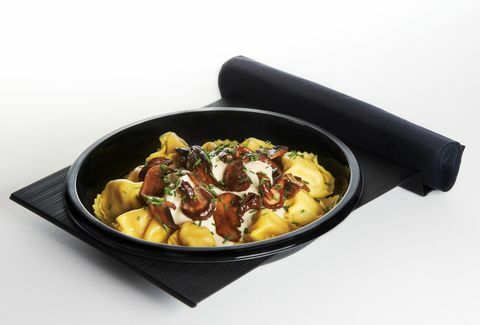 LATAM Airlines Group has introduced a new gastronomic concept for economy cabins on its long-haul flights with durations of seven hours or more. Passengers will receive a new menu with three options for lunch or dinner, which includes a hot dish, vegetarian or a lighter cold option, a drink service and a sweet snack. Two new breakfast choices are also available. In total, the company has created more than 300 new dishes, which will serve an average of 14,000 passengers on 64 flights each day. The new service will offer a selection of main dishes with increased portion sizes. New serving trays have been designed and implemented to provide a more convenient dining experience with built-in plates replacing small modular dishes on trays. LATAM conducted test flights where passengers were surveyed about the general flight experience. Dining experience satisfaction scores improved by 28 percentage points with the introduction of the new food concept compared to the previous offering. The new menus will be implemented on LATAM Airlines’ network of flights connecting Europe to Latin America, including those operated by the Boeing 787, 767, 777 and Airbus A350 aircrafts. This new concept is already available on routes to and from Chile and will be rolled out across the company’s international network by the end of 2017. The new menus were developed in partnership with global experts in airline catering at the Gategroup Innovation Center in Amsterdam. LATAM catering team collaborated with cabin crew and the specialized chefs of Gategroup, factoring in service time and restrictions of service in an onboard kitchen and galley. The Group employs over 43.000 people worldwide, operating more than 1,300 flights per day and transporting 67 million passengers per year. LATAM Airlines Group has a young and modern fleet. Its 304 aircraft average an age of around seven years and feature the latest models including the Boeing 787, Airbus A350, A321 and A320neo. LATAM Airlines Group (formerly LAN Airlines) comprises affiliates in Peru, Argentina, Colombia and Ecuador as well as LATAM CARGO and its affiliates; in addition to TAM S.A and its affiliates, TAM Linhas Aéreas S.A. (LATAM Airlines Brasil) and its business units TAM Transportes Aéreos Del Mercosur S.A. (LATAM Airlines Paraguay) and Multiplus S.A.
LATAM is the brand adopted by LATAM Airlines Group member airlines and is being rolled-out in its products and services, as part of a gradual integration plan. LATAM Airlines Group is the only airlines group in Latin America and one of two worldwide to be part of the Dow Jones Sustainability ‘World’ Index. In 2016, it was recognised by the index for sustainable practices, based on economic, social and environmental criteria, for the third consecutive year. LATAM Airlines Group shares are traded on the Santiago Stock Exchange and the New York Stock Exchange in the form of ADRs.